I was just a few meters away from the finish line when our friends took this photo. I love how they captured my emotions here. I was on the verge of letting out a happy cry here. You see, 3 kilometers from the finish line I was already feeling so low. Although I didn't pressure myself much on this race, I still made a mental goal of finishing it at 6 hours. And I thought that was more than feasible. At kilometer 35 though, I started feeling extremely weak (at this point, I ran for more than 5 hours already) so I chose to do a 2min run/1min walk which at some point would end up a 2min run/3min walk (I was actually walking more than running already) I knew I wasn't in any way going to make it at 6 hours. The thought of the finish line didn't excite me anymore. But on my way down I started hearing the drums beating and race marshals cheering the finishers, my mood made a 360-turn. I suddenly felt alive. So I made a dash to the finish line. I realized how BIG an experience this was. And how blessed I was to be healthy enough to finish a marathon. Add to that the sight of friends cheering on me just a few meters to the finish line, I just let out a shout -- "I MADE IT! NATAPOS KO! NATAPOS KOOOOOOOOOOO!" 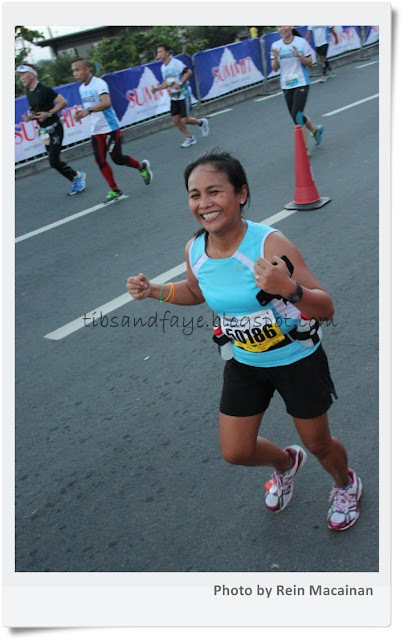 Condura Skyway Marathon 2013 Photos Now Up!